Alps Cedar Ridge Rimrock 6 Tent is a freestanding 2-season and very affordable tent with fiberglass poles, one door, two windows, and a very easy setup. Cedar Ridge Rimrock 6 Tent front view. This Rimrock 6 tent is a part of a larger series that includes the tents for 2, 3, 4, 6, and 8 people. All of them are single room dome-style tents with the exception of the 8-person tent which is a 2-room cabin structure. These tents have been on the market for many years already. If you are not familiar with the brand, perhaps you might want to know that this is a sub-brand of the Alps Brands which includes well known the Browning Camping (or Browning Licensee), Alps Mountaineering, Alps OutdoorZ, and Alps Cedar Ridge. The tent is a very simple structure with an easy setup, and fully freestanding. The meaning of this is that the poles attach to the corner grommets, and then the fly also clips to them. So even when you add the fly, you can still move the tent and rotate. The Cedar Ridge 6 tent shown without the fly. This is a tall structure with 72 inches (183 cm) peak height and you even have windows on two sides, the door is large and small awning keeps the fly up so getting in and out is easy. Capacity: The declared capacity is 6 people, but the area is too small as usual with such tents, you have 100 ft² (9.3 m²). So this would give 16.7 ft² (1.5 m²) per person. There are no vestibules to store your gear and shoes. So although this is a big tent with 10 x 10 ft dimensions, and you could eventually put 6 pads on the ground, I would say that ideally this is a tent for couples, or for parents with a small kid. Seasons-wise, this is a summer camping tent or perhaps a 2-season tent (summer, late spring, and early autumn). They do not provide any information about the waterproof rating, the fly does not cover the front and back sides, so I would avoid serious tests with this tent. The structure is very stable and aerodynamic, but because the fly does not go to the ground on the front and on the back, such a construction is not for strong winds. There is lots of mesh in the upper area and on the door and back window, so you can have lots of ventilation in a warm environment. But this same mesh also makes it unsuitable for a cooler climate. Weight & packed size: You will see in the comparison table below that both the weight and the packed size are typical for such a type and such materials. This is not a lightweight tent and if you need something to carry on the trail better check this list with backpacking 6-person tents. 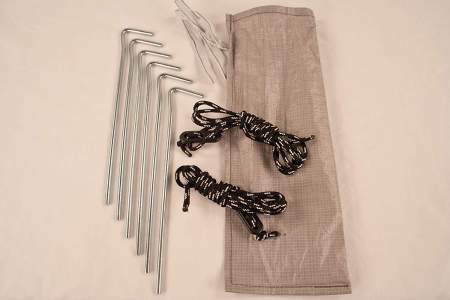 The tent comes with fiberglass poles, not surprising in view of its price. Fiberglass needs a bit of care but many low-cost tents on the market come with such poles. 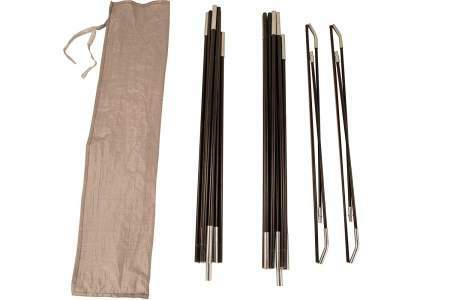 About tent poles you can read more in my separate text. So you have two 11-mm diameter poles that create the dome, plus two short poles that create small awnings on the front and on the back. All of them are shock-corded for an easy setup. The structure is self-supporting and freestanding as soon as you pass the poles through the sleeves and attach them to the corner grommets. 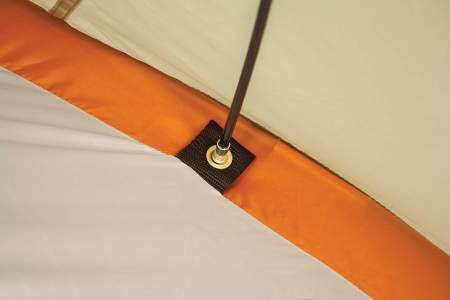 Extra attachment is with clips, one on each side of the poles above the corners. Two main poles plus two brow poles. They do not give much info about the fabric, but this is a 185T polyester used for the fly and the walls. The floor is a bathtub style polyethylene so you should be almost completely safe from that side, such materials do not pass water easily. Though I notice that the floor material does not go very high above the ground and those seams can be exposed to splashes in the case of strong rain. All seams are factory-sealed, but there is no information about the waterproof rating. There is one door only and it is with a panel and mesh, so you can have a window on the front. One more window with the same double-layer design is on the back. The mentioned awning poles lift the fly so you have views in the two directions. As long as the sky is clear you can have a good ventilation in this tent, but if it is raining the panels must be closed. In this case you might have issues with condensation, there are no floor vents here. The windows are with #8 zippers so you can keep the panels at any position. This is a great feature for such an inexpensive tent. 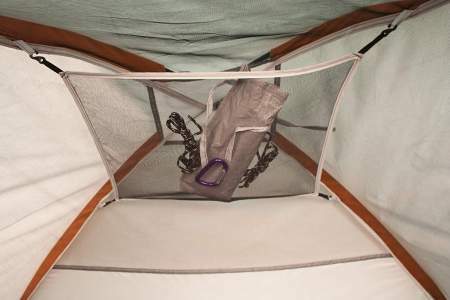 The tent comes with a gear loft (shown below). Not for strong rain and winds. Weight: 15 lb 8 oz (7 kg). Dimensions: 10 x 10 ft (3.05 x 3.05 cm). Area: 100 ft² (9.3 m²). Area per person: 16.7 ft² (1.5 m²). Packed size: 23 x 9 in (58 x 23 cm). In the table below you have this Rimrock 6 side by side with two other tents built in the same style, with partial fly and freestanding. They have many similar features and the numbers are close to each other. So it makes sense check the current prices, so please follow the links and compare. 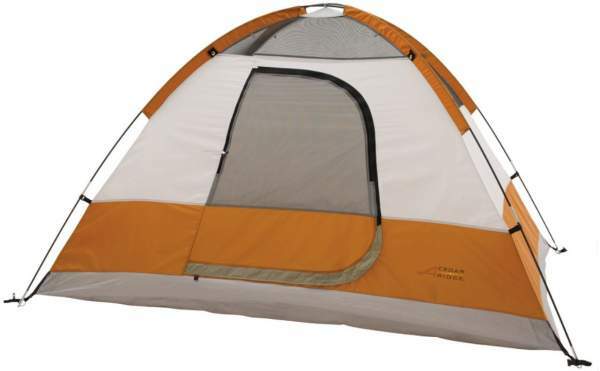 This Alps Cedar Ridge Rimrock 6 Tent is a very simple and easy to use structure. If you are on a budget and need something for occasional outdoor adventures, this is a tent you might want to check. But as I said above, do not put it to serious tests. It is best suited for a dry area without strong winds. For a climate with lots of rain better check some of these tents with full rain fly. If you need more options in this size range, check under the category Tents for 5 & 6 people, and check also this Browning Camping Big Horn 5 Tent and NTK Hunter GT 5 to 6 Person Tent, both new on the market. See also this unique Therm-a-Rest Tranquility 6 Person Tent with its two rooms. Note that this is not a sponsored text and I am not paid by the brand. Thank you for reading and please use the comment box below in the case of questions and comments. Have a nice day.